One of the most complex provisions of the Tax Cuts and Jobs Act (TCJA) passed in December 2017 is the deduction related to pass-through entities, also known as Sec. 199A. Determining the deduction includes a matrix of complex calculations -- the chart above may help demystify the general concepts and income levels that determine the application of the deduction. 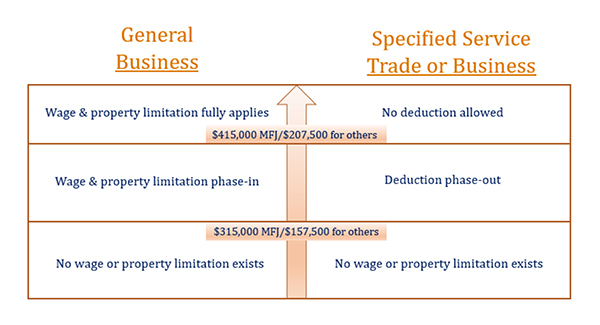 General business in TCJA is defined as "qualified trade or business" that generates qualified business income (QBI) for the pass-through deduction. Income qualifying for this deduction includes the QBI of proprietors, partners (including LLC members), and S corporation shareholders. Healthcare is listed as an excluded trade or business for determination of QBI. As such, healthcare entities fall into the dreaded category of "specified service trade or business" (SSTB). The Field of Health includes the provision of medical services provided by physicians, nurses, therapists, psychologists, and other similar healthcare professionals performing services provided directly to a patient. The "field of health" does not include services not directly related to a medical services field, even though the services provided may purportedly relate to the health of the service recipient. And this is where the discussion begins. The proposed regulations do not expressly address certain types of businesses that may not "provide medical services directly to a patient." The proposed regulations provide some examples that may help determine if an entity is eligible for the Sec. 199A deduction. One healthcare example involves a dermatology practice that sells skin-care products to its patients. The products are sold in the same space as the dermatology practice and by the same employees who work for the dermatology practice. In the example, the gross receipts for the skin care products are only 5 percent of the entity's overall gross receipts. Although the sale of skin-care products is not "the performance of services in the field of health" as defined in the proposed regulations (since the gross sales are minimal and the services are co-mingled with the practice), they are considered an incidental service and therefore are excluded from the Sec. 199A deduction. If the skin products were sold in a separate business, with a separate lease and employees, would it be classified as an SSTB? Is an optical dispensary that is operated in a separate entity -- with a separate lease and employees -- an SSTB? A lot of the determination will depend upon a careful analysis of facts and circumstances in light of a complex set of determining factors. The proposed regulations also address anti-abuse rules. Any trade or business that provides 80 percent or more of its services to a 50 percent commonly owned SSTB will be treated as an SSTB. The regulations include an example of a law firm attempting to spin off their administrative services into a separate LLC. In the example, there is 50 percent common ownership and all services are provided to the law firm, resulting in the LLC being classified as an SSTB. The same result would apply to medical practices that have management companies with 50 percent common ownership that provide billing services solely for the medical practice. On the brighter side: If the owner of an SSTB's taxable income is below $315,000 (married filing jointly) or $157,500 (all others), they qualify for the 20 percent deduction. The deduction phases out between $315,000-$415,000 for married filing jointly and $157,000-$207,500 for others. Also, keep in mind this is a deduction taken on the owner's individual income tax return (Form 1040). The deduction does not reduce self-employment income or net investment income, but it also is a deduction for alternative minimum tax purposes. You also do not have to itemize your deductions in order to take this deduction. 200 pages of proposed regulations cannot be completely addressed quickly or easily, and this component of the tax law change is complex and fraught with intricate calculations and interpretations. Best advice is to tread carefully and seek expert counsel. 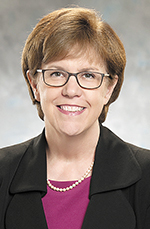 Lucy Carter, CPA (lcarter@kraftcpas.com), is a member and practice leader with the KraftCPAs Healthcare Industry Team. 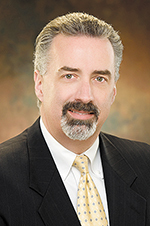 Mark Patterson, CPA (mpatterson@kraftcpas.com), is a member with the KraftCPAs Tax Services Team. Visit KraftCPAs.com for information about the firm's full range of healthcare services.